“Crease” is a set of armchair and side table made from one single sheet of clear acrylic. By simply cutting and using heat-bending technic, this set of furniture has the inherent minimal design aesthetics from its making to the final appearance. The transparent look not only showcase all the folding details, it also builds a lightsome experience while using the furniture. “Crease” is designed with an idea of minimizing the use of metalware and accessories while making and assembling furniture. By using one single sheet of clear acrylic and other production methods such as CNC milling and heat-bending, it minimizes the material waste, optimizes the manufacturing process and eventually provides a set of contemporary designed furniture to people. 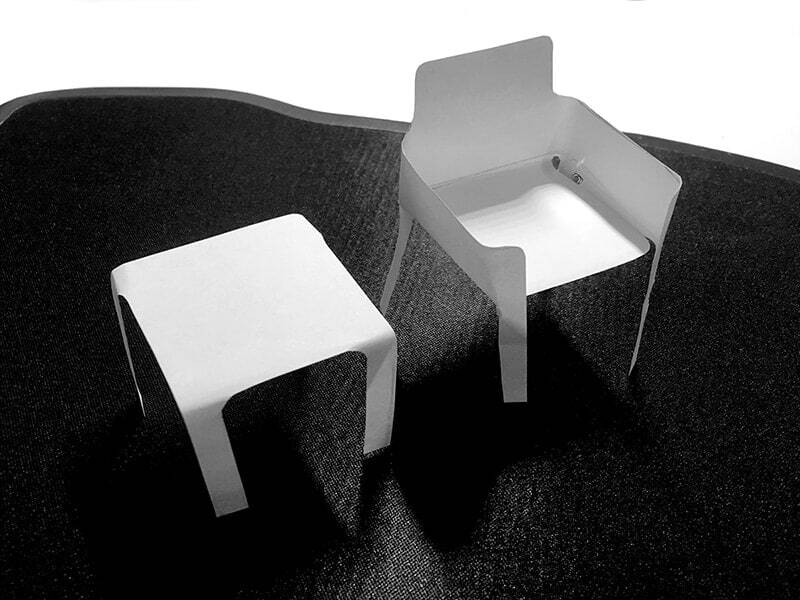 The name “Crease” is coming from designing around the concept of minimizing material use in furniture design. Inspired by paper folding, “creasing” paper will automatically create two joint surfaces, which eliminates the use of adhesive or metalware. I chose Acrylic because it is one of my favorite modern materials for many design tasks. Acrylic, also known as Poly (PMMA), is a strong, tough, and lightweight material, especial a great substitute for glasses. By heating and processing it correctly, acrylic can be finalized to any desired shape. I decided to use clear acrylic since it creates a fragile illusion and also showcases all the folding details for association with origami art. I used Solidworks and Keyshot for CAD modeling and rendering. However, it all started with drawing and cutting from a single sheet of paper. I tried many different ways of folding and cutting and finalized with this particular design that has chair and table legs relatively perpendicular from one pair to another. This is a self-initiated project; therefore, it’s new to the audience. Based on what I saw on the Internet, people really like this clean design style, especially how simple the design looks like. And I wish more people could learn what are the reasons behind designing this set of furniture. Graduate Industrial Design student at Pratt Institute. This is awesome, cool design! Hello admin, do you monetize your designideas.pics ?